The largest diamond in the world needs the greatest security system in the world. Thankfully, they've hired you to main the turret right above the glass case with the okay to shoot on sight. 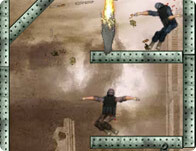 Shoot the ninjas and the cat burglars to gain cash and build up your fortifications and weapons. Always head for the head! That's a no-brainer. Use your mouse to aim and shoot. Use Spacebar to reload. Buy equipment at the end of every wave.